Everyday we walk into our local convenience store and see a whole glass case full of water bottles. We each take 30 minute showers and flush our toilets more than 5 times a day. The average family of four can use 400 gallons of water each day, but some people don't even get one. There are people in this world who will never know what its like to drink water from a bottle much less water without dirt and to us its a daily thing. Now is the time to help end this. I don't want us to be just another group of Americans trying to be helpful, I actually want us to be. I know that we can all beat my goal if we really try. I can't stand to know that there is really people out there dying because they can't get something that we take advantage of. Since we have so much clean water we don't realize the importance of fresh filtered water, but these people do and we need to help them get what they deserve. Please help me and donate. I'm pledging to end this problem and I know I cant do this on my own. We are blessed to live in a place where we have these advantages and lets not deny something so important to others. Please help and share my page and get your friends to donate also. We need to get the word out and meet my goal. Penny's can even count. Even of you cant donate share this! 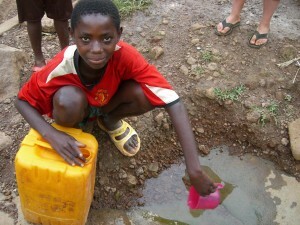 Lets get fresh water to everyone, just like we have it here. 06/19/13 Rosemarie Rothenberg $23.00 go hannah go! !